The fun, pastel tropical colors create a fabulous vibe on this frame. 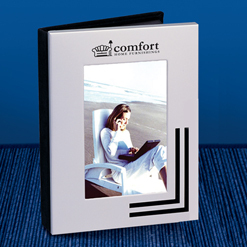 Made from beveled glass, it holds a vertical 4 x 6 photo surrounded by a dark border. The words 'Life is Better at the Beach' are written in white lettering on a driftwood backdrop. Size is 6 1/2" x 8 1/2". Sea, sky and swaying palm trees. Black velvet easel backing. Packaged in a white box. A fabulous frame for vacation photos, beach-themed events and destination wedding photos! Capture your team's special moments and showcase them in a themed frame, designed specifically for basketball. 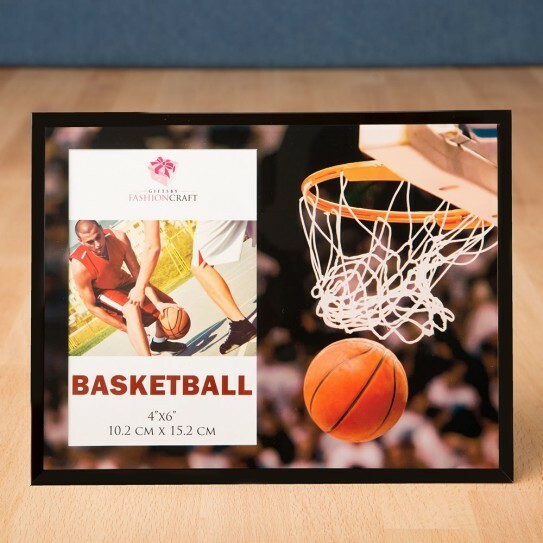 Capture those adrenaline pumping memories of a great game when you frame them in a basketball themed frame. Our quality frame is made from bevelled glass and features a stunning vibrant colored picture of a basketball falling through the hoop. The frame will hold a standard picture sized at 4" x 6". Frame measures 8 5/8" x 6 5/8". Individually packaged in a white box. Black velvet easel back. A unique sport's themed frame for basketball. No Imprint Available. When ordering indicate which design you want. 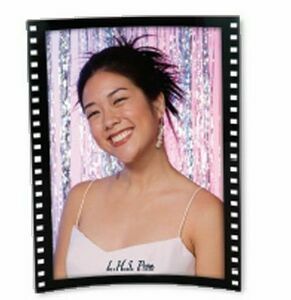 Add a touch of class to your elegant affair with these chic photo frame favors. 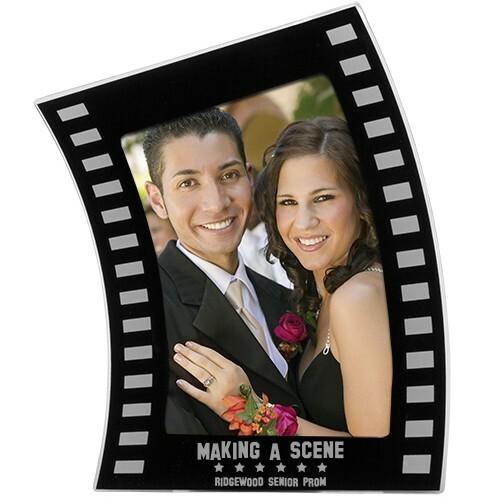 Each of these classy designed black epoxy photo frame favors has stylish curved edges and is accented with carved heart cut outs in the corners with perfectly placed sparkling crystals and highlighted in an elegant black enamel finish . 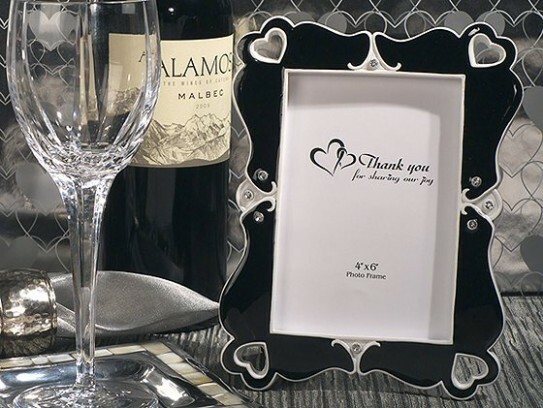 These frame favors are sure to be used by your guests for years to come and bring back fond memories of your special occasion. 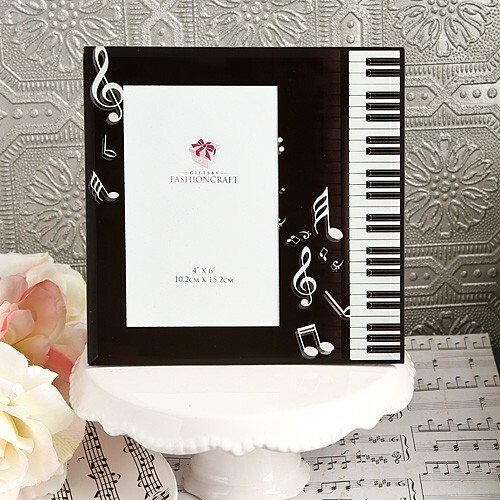 Each favor measures 5" x 7" and holds a 4" x 6" photo and comes individually in a white box. 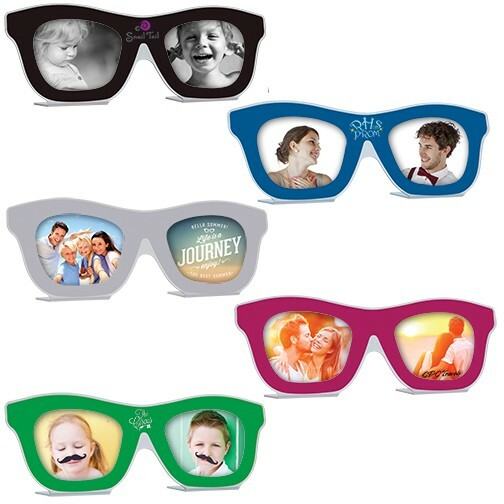 These distinctive Victorian design frame favors have traditional style with modern appeal. Frames make lovely and useful favors for all occasions. And whether you choose to fill them with a special photo or let your guests choose a memorable photo of their own, these frames are as pretty as a picture! 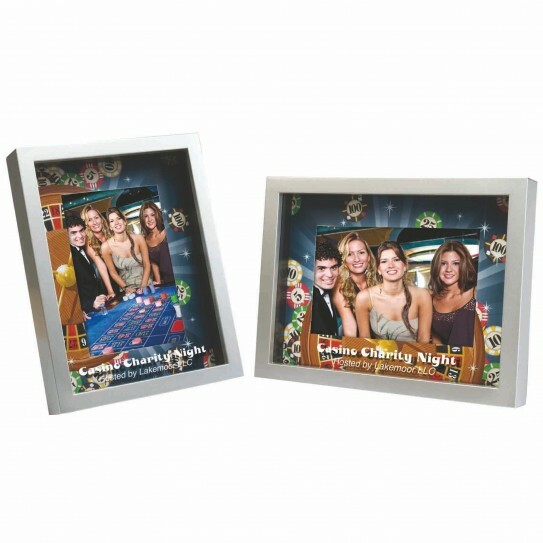 Each pewter finish poly resin frame measures 5.5" x 7.125" and has lovely Victorian flair with inlaid ivory enamel and a curved outer edge with a beaded design and glistening rhinestone accents, framing a 4" x 6" photo window with glass at its center. The black craft paper back is hinged for photo insertion and includes an easel cut for both vertical and horizontal display. Each Victorian design frame favor comes in a white box. Filmstrip, Sprocket Hole, Rectangle, Vertical, Photo Holder, Photo Window, Photograph, Snap Shot, Border, Easel Stand, Desk Top, 5" x 7" photo holder, 6" x 7-1/4"